Last night, Ghostcrawler, one of Blizzard's more active blue posters, hopped into a thread griping about Warcraft's default User Interface. Though he did not address any specific changes or even confirm that changes were incoming, he did mention that the default raid UI is something Blizzard is "discussing a lot right now." He also indicated that he wanted to get additional feedback on using the default UI specifically with regard to healing. Feel free to check out the thread here and share your concerns. The ridiculous number of UI mods floating around has always been a testament to the inadequacy of Blizzard's default, but really, that is no surprise. Azeroth is a complicated place and Blizzard has many, many mechanics which require scrutiny and attention. Of course dedicated fans who are limited as to what they can modify and have unlimited time will be able to produce something more sophisticated and in line with player desires than Blizzard can ever hope to. Even if Blizzard modifies the UI to be more accommodating to raid healers, I would expect that changes will suffer from Equipment Manager syndrome. Sure it will be better than what we had before (nothing), but it will still be an inferior product to the add-ons Blizzard tries to copy in the first place. Kil'jaeden is an exceptionally cool looking boss with a rather epic death (kind of) animation. 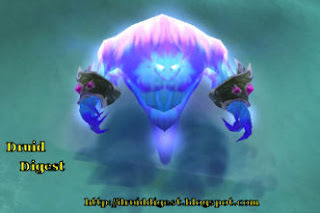 Unfortunately, because Fury of the Sunwell was released relatively close to the advent of WotLK, many players never had the opportunity to confront the Burning Legion's acting Demon Lord. So, if you have not seen the Demon's defeat, you can either get together some comrades and take a long and arduous journey though Sunwell Plateau, or you can watch the video below. I was running around on one of my low level alts today when I stumbled across no other than the infamous Sludge Beast, an oozy rare spawn who patrols the Sludge Fen in the northern Barrens. Crossing my fingers hoping for a shiny new green, I made quick work of the disease spewing beast before any other lowbies could swoop in and steal my find. As I bent down to loot my fallen adversary, something miraculous happened. 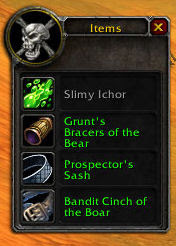 Hidden amongst the slime was not one, not two, but three precious green items met my ey e. Nestled next to some Slimy Ichor were Grunt's Bracers of the Bear, a Prospector's Sash, and a Bandit Cinch of the Boar. My temporary diversion for a single piece of BoE goodness had yielded more fruit than I could of imagined. Sure, it was only three pieces of lowbie loot, but the real reward was defying the odds and stumbling across a bit of fortune you do not see every day. Sure, a single BoE Blue would have netted my little Orc more coin, but it would never have struck me as exceptional. I certainly would not have taken a screenshot of it. Also, just in case you were wondering, the Grunt's Bracers of the Bear looked quite fetching on my budding Warrior. It is amazing how music affects the tone of a video. Case in point, see what music from Sum 41 manages to do to the Wrath of the Lich King introductory cinematic. It is not quite Pink Floyd over the Wizard of Oz, but it is still pretty darn cool. Bringing a solo character from level one to eighty takes a lot of time and effort. Why waste your work by planting your toon on a server you will ultimately be disappointed with. A little bit of homework can go a long way in avoiding a scrapped character or a $25 transfer fee. First things first, do some preliminary research. Pick your initial targets by identifying servers of a type, size, and timezone that meets your needs. 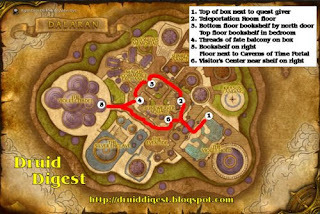 Next, check the forums of any server you are targeting on the World of Warcraft Community Website. This will give you some sense of the server's "tone" as well as an idea of who the power players are. Go a step further and peruse a few of the major guilds' websites. Even if you are not planning to be an endgame raider, you will be sharing Azeroth with these people. If the server seems to mesh well with you thus far, it is time to make a toon. However, do not get too invested yet. Do some initial leveling and then spend a fair bit of time in one of your faction's major cities. What is the conversation in Trade Chat like? Is there a lot of activity in the Looking for Group Channel? Are people looking to fill spots in groups that correspond to the role your toon will ultimately play? Next check the Auction House to see how the server's economy is doing. A healthy server economy will have wide variety of goods available and healthy competition amongst sellers. Doing this initial investigation will go a long way to saving you headaches down the road, but keep in mind that no matter how diligent you are things can change. Free server transfers can change the complection of a server literally overnight. It is always a possibility that your new server will be a far different place by the time you hit level 80. However, you will always be better served to assume a good server will stay good as opposed to betting on a bad server turning things around. Simply put, Wild Growth is an amazing healing spell. Since mana conservation is largely a thing of the past, many Restoration Druids have taken to using this handy group heal whenever the six second cooldown is up. The cast is not cheap, but if you are able to land the buff on five (or six with Glyph of Wild Growth) needy targets, Wild Growth is an exceptionally efficient heal. The only real question is, who should you target with this tasty AoE HoT morsel to get the most bang out of your buck. In raiding situations, especially those marked by periodic raid-wide damage, there will rarely be a situation in which there are not at least five targets within 15 yards of each other who need your love. This could be a pack of ranged dps and healers or, more often, it will be a pool of melee dps crowded near your tank. In raids, unless your ranged units are grouped and you are tasked with keeping them up, your tank is almost always a safe target. Generally speaking, in a 25 man, it is much harder to cast Wild Growth on a bad target than it is to find a good one. In heroics, five man content, and PvP, however, it can be more difficult to assure that there are five recipients within range of your target. Generally speaking your ranged units and healers will not be within 15 yards of your tank and melee pack. Also, if you manage to find five or more people in either group, something bizarre has happened and I would like to see the screen shot. In a smaller group situation, it can then be tempting to view your Wild Growth target selection as an "either-or" proposition. Either you heal the ranged or the melee. Fortunately, there is a middle ground between your ranged and melee group...literally...and if you stand in it and hit yourself with Wild Growth, everyone can feast on your healing goodness. Enabling Auto-Self cast in your Combat Configuration menu or setting up a macro to target yourself and cast makes things all the easier. Keep in mind that the name of the game with Wild Growth is to hit the maximum number of targets every time. Often that simply means taking positioning into your own hands and casting it on yourself. One of Azeroth's most infamous adventurers gets played off by the feline viral sensation. Sure, Keyboard Cat is a poor man's Dramatic Chipmunk, but that doesn't mean this video isn't funny. Spellpower is an interesting stat because the actual impact which it has on an individual spell is not constant across your spell book. Instead, a percentage of your total spell power is applied to each spell, or part thereof, based on values Blizzard has assigned. These percentages are invisible so it can be difficult to know what impact an increase in spellpower will have on each individual cast. Below, I have broken down the baseline percentages of your spellpower which are applied to each Druid heal except Tranquility as of this posting. You will also find available mechanics which may be used to alter that percentage. Keep in mind that the boost from spellpower is generally applied before other effects which increase the power of your heals (such as Gift of Nature). Lifebloom: 9.5% of your spellpower is added to each individual tick and 64.6% is added to the bloom. Those percentages are increased to 11.4% and 77.5% with Empowered Rejuvenation. Nourish: 67.3% of your spellpower is added. Healing Touch: 161.0% of your spellpower is added. It can be increased to 225.4% with Empowered Touch. Rejuvenation: 37.6% of your spellpower is added to each individual tick. This can be boosted to 45.1% with Empowered Rejuvenation. Wild Growth: An average of 11.5% of your spellpower is added to each individual tick. This goes to around 13.8% with Empowered Rejuvenation. Regrowth: 53.9% of your spellpower is applied to the initial heal and 18.8% is added to each tick. The percentages can be pushed to 64.7% and 22.3% with Empowered Rejuvenation. As a word of warning to all the budding Moonkins out there, while in a group, please use Typhoon sparingly. Positioning is often critical to your tank and dps both in terms of maximizing their damage, avoiding non-targeted attacks, and preventing wipes. As a result, scattering a pull around like a fallen house of cards will rarely lead to anything but frustration and death. If you plan on using Typhoon in instances, use it smartly. If you want to use it simply for AoE damage, consider the Glyph of Typhoon. I would, however, steer you away from that course unless you are certain as the knockback can be exceptionally useful when applied properly. For example, a well placed Typhoon at maximum range can be the perfect tool for knocking a mob who is charging your healers/ranged dps right back into the tanks lap. It is also a reliable interrupt which can hit multiple casters at once. Though again be weary of undoing the work your tank did bunching all those caster mobs up in the first place. Just keep in mind that Typhoon is useful, but generally speaking, only in small doses. Every one who has ever run an instance with a PuG (Pick up Group) has met that guy. He is the one who the group openly ridicules and the source of the many wipes which ultimately lead to your tank "restarting his computer" indefinitely. There is a that guy for every spec of every class. Put simply, that guy is a bad group member. Being a bad group member does not involve having bad gear or not blowing consumables, it simply entails not doing things to help your group and doing things which harm them in the process. Below I take aim at PvE Retribution Paladins laying out the dos and don'ts of contributing to your party as a dps spec which is so hot right now. Your tank, absent direct instructions to the contrary, wants only two things from you. First, do not pull agro. Everyone in your group is sufficiently impressed with your massive Paladin dps. While pulling agro amongst your friends might be a point of pride, in a pickup group it is frustrating at best. If you start moving two far up the agro table, lay a few blows on another target and/or Hand of Salvation yourself. Your tank will love you for it. Second, keep track of your positioning. As a melee dps, you are on the front lines of the eternal struggle against the enemy of the day. The risks of you stumbling too near a roving pat or nearby bunch of mobs is always high. Whenever there is doubt, err on the side of caution and stay farther away from nearby mobs than the tank. That way, if he is not pulling them, neither will you. Along the same line, try not to stand in front of mobs. Many of Azeroth's denizens have crafted nefarious means of slaying all that stands before them. Try to see that you do not become one of their victims. Though you may not be a tank, you are wearing plate and with great power comes great responsibility. You are always your healer's second line of defense right behind the tanks. If a mob makes a break for the healers time to bust out Hammer of Justice or Repentance. If your crowd control is on cooldown, throw a little bit of dps the mobs way. Generally speaking, a mob is not going to pound on your healers unless it is relatively agro free. This means you are only one massive crit away from being the mobs new best friend. Keep in mind you are only a temporary distraction, do not pile on the dps and bring the mob promptly to the real tank. Many an avoidable wipe has been caused by a Ret Pally afraid of getting hit. The second way you can help your healer is to reduce his work load by healing yourself. The Azerothian gods gave you Art of War for a reason. Go into your interface settings and enable auto self-casting and use those massive holes in your rotation to instant cast Flash of Light yourself. Since, your instant heals no longer reset your swing timer and mana regeneration is a breeze, there really is no reason not to. The same advice about protecting your healer also applies to your fellow dps. You should be the hardiest of your damage dealing brethren so if someone other than the tank is doomed to take a blow, make sure it is you. Though it may take a bit more to pull a mob off an agro hungry dps, never forget that you are just a temporary target so keep it as easy as you can for the tank to reestablish agro. Also, stay on top of your buffs. Paladin buffs, when combined and properly used, are fairly potent and can make a noticeable difference in your groups damage output. Give your group members the buffs they want, not the ones you think they should have and refresh them before they expire. If you find yourself frequently being asked for a rebuff, you are not doing your job. One of the best way to serve yourself and your group is to not die every other pull. PvE Ret Paladins are notorious for getting cut down enemy mobs. Defy the stereotype by keeping your self bubble handy and watching your agro. The extra dps you gain by jumping most of your tanks first attacks will never equal the dps you lost by being dead for 99% of that one pull. Resurrecting you takes time and mana. Take your time, be prepared, and watch your positioning and you will see the end of many battles. Lastly, spec for success. You are, no doubt, born and bred to be a dps juggernaut, but you are also a team member. When selecting talents keep in mind that your contribution to a group is measured not by your place on the damage meters, but by how you raised your group's damage and survivability on the whole. In the long run, you and your groups will benefit. Minor Glyphs are not designed to be game changers, but they should not be a waste of your slots either. I have set aside some space below to discuss each of the Druid Minor Glyphs offering my thoughts on which Druids should and should not choose each. More so than most other things in Azeroth, what Minor Glyphs you select are largely a matter of personal taste though, so take my recommendations with a grain of salt. Who should take it: Regardless of spec, if you are leveling up through questing, this Glyph can save you an appreciable amount of time. Obviously, Sea Blob is a highly situational form and you will not be seeing constant mileage out of this one, but when you head off to search the sea for chests, lobster traps, herbs, or quest mobs to kill you will be glad you have it. Who shouldn't take it: Very few people at endgame will find much use for this Glyph. Also if you are grinding your way to 80, it looses some of its lowbie appeal. At 80 I would avoid it unless you spend way to much time in Arathi Basin, have an insatiable need to harvest aquatic herbs, or cannot think of anything better. Who should take it: Bear tanks should always choose this Glyph. Who shouldn't take it: Anyone who is not a bear tank should never choose this Glyph. Who should take it: PvP Feral Druids will not want to go without this Glyph and really any PvP Druid, regardless of spec can benefit from it. Mobility is gold, especially in Battle Grounds, and being able to Dash 36 seconds sooner could easily make a world of difference . In PvE it can be helpful when leveling to escape bad pulls and the enemy faction with greater frequency. Who shouldn't take it: Aside from the levelers listed above, most PvE Druids won't find much benefit in this Glyph. Even for PvE feral druids, Dash is such a novelty that you will rarely, if ever, take advantage of the diminished cooldown. Who should take it: If you are solo leveling, regardless of method and spec, take this Glyph. While playing on your lonesome there is no reason not to have Thorns up on yourself at all times. Over the course of your trip to level 80, you will save yourself hundreds of casts which incrementally saves you mana and downtime. These same benefits also apply if you are still doing some heavy solo questing at 80 (such as farming dailies). Bear tanks should also consider this Glyph as, if you are the only Druid in your group, shifting to caster form every 10 minutes to buff yourself gets old quick. Who shouldn't take it: Any PvE Druid who spends most of his or her time in groups likely won't be self-buffing with Thorns, except maybe bears. Also, this talent is a bit of a waste for PvP Druids as if you are getting hit enough to warrant having Thorns up, odds are you will not be alive for more than 10 minutes anyway. Who should take it: Obviously only Balance Druids should ever even consider using this Glyph and even they would be wise to heed the reservations below. Who shouldn't take it: No Resto or Feral Druid should ever use this Glyph. Similarly, PvP Balance Druids should not take this Glyph as the knockback and the interrupt associated with Typhoon are delicious. The same applies in PvE, but if you happen to be experimenting with an AoE focused raid Moonkin build, this talent will keep you from frustrating your raid mates with Typhoon's knockback. This Glyph will save you less than 100 mana per cast so only use it to disable the knockback, not to conserve mana. Who should take it: This Glyph would be more aptly named "Glyph of Bag Slot" or "Glyph of Pocket Change," because that is what it gets you. If not having to purchase and carry around Starleaf Seeds appeals to you, carry around this Glyph instead. Who shouldn't take it: Anyone who values one of the other Glyphs more than the value of not needing a reagent to combat res should trust their instincts and look elsewhere. Who should take it: Any Druid will benefit from this talent. Less mana spent buffing equals less down time for both you and any group you happen to be in. If you have an empty Minor Glyph slot and do not know what to stick there, take this one. You will not come across many Druids without it. Who shouldn't take it: Once all of your Minor Glyph slots are open, every Druid should probably have this Glyph.